Apologies for the post-Tour de France “black hole” that was The Science of Sport! Following and analyzing three weeks of racing left the inevitable backlog of work, which also happened to pick up to warp-speed at the conclusion of the Tour! However, recovery time now over, I am in the process of putting together the next series, which I’ll start as soon as I can, on The Physiology of Pacing Strategies. That will be a video series, consisting of perhaps six or seven short videos, which will bring us neatly to the IAAF World Championships in Daegu. Genes, innate ability and talent? Or practice makes perfect? Is it all in the training? But for this week, a few posts on a topic that is both fascinating and, for me, very frustratingly hyped in the media (and, interestingly enough, within sports science as well), and that’s the issue of genetics/talent vs training as a requirement for success. I recently co-authored a review on this for the journal Dialogues in Cardiovascular Medicine, and am busy working on a second review on the relative contribution of genes and practice to performance. Those articles will be published in 2012 (I’ll let you know when). I have also done a few presentations on this in the last few weeks, at the University and to the public, so it’s a topic that I’m pretty immersed in at the moment. And then last night, I received an email from a journalist with the Evening Standard of London, asking for some thoughts on a piece that they carried a few days ago. It was an article called “Why we’re the best”, and it speaks about culture, practice, genes (or the lack thereof) and other factors that determine why, for example, Kenya produces great runners, China great table tennis players and Australia great swimmers. You can read that piece here, but I just want to highlight some of the key phrases that warrant a mention, and then evaluate them critically. I’ll do this in two parts. The second (later this week) will look at genes and how genetics may influence performance. Why we win: Culture, practice but not really the genes? Champions are born, not made? Success, he [Peter Keen, director of performance at UK Sport] said, was “massively culturally determined” as it dictates what you can “interact with and what is denied you” as a sportsperson. Tradition, success, climate factors, cultural factors – these are more important than some apparently fundamental drivers, such as genetics. But despite Professor Morrison’s assertion, attempts to identify a generic speed gene are unsatisfactory. The search has focused on a gene known as ACTN3. This is because there are two types of muscle fibres, slow twitch and fast twitch. Slow twitch fibres are more efficient in using oxygen to generate energy but fast twitch fibres fire more rapidly and generate more force. These are the ones believed to aid speed and ACTN3 is the gene considered key to their development. Let me start out by saying that culture, training, diet, opportunity are all crucial to producing sporting champions or elite performances. But the problem with the debate as it stands is the relative dismissal of physiological factors like genes, and also the extremely oversimplified view that “it’s all about the training”, or that science suggests genes don’t matter. My purpose with these posts is thus not to dismiss the role of training, culture or belief, but rather to balance out the argument with the facts. And in so doing, to give an indication of just how complex it really is – the only certainty is that whoever says that success is due to one or two things is wrong. So there are a couple of claims in the above quotes from the article, and they’re worth looking at a little more closely. We start with the 10,000 hour claim in today’s post. Tomorrow, I’ll look at the genes and the claims made about the absence of genetics. It is stated in the article that “the simple truth of any successful athletic performance is a minimum of 10,000 hours of deliberate practice”. There’s another way to interpret this finding, which I’ll get to later in the piece. First, a major statistical “omission” in the paper undermines how the conclusion of Ericsson and those who argue for 10,000 hours can be made. I have that study, and what is remarkable about it is that Ericsson presents no indication of variance – there are no standard deviations, no maximums, minimums, or ranges. And so all we really know is that AVERAGE practice time influences performance, not whether the individual differences present might undermine that argument. Statistically, this is a crucial omission and it may undermine the 10,000 hour conclusion entirely. I must emphasize this point strongly: If the theory is that 10,000 hours of practice are needed, and there is no innate ability, then you should not find a single person who has succeeded with fewer than 10,000 hours, and nor should anyone fail having done their 10,000 hours. Take a look at the graph below. I’ve highlighted only the “best expert” and “least accomplished” players, and shown some hypothetical dashed lines to show the ranges within each group. It’s conceivable that there is a range of practice times within each group, such that there is a person in the “least accomplished” group who does 10,000 hours (shown by the blue circle) without cracking that performance level, and a person who does less but succeeds (shown by yellow). “The striking thing about Ericsson’s study is that he and his colleagues couldn’t find any “naturals”, musicians who floated effortlessly to the top while practicing a fraction of the time their peers did. Again, I don’t know how he arrives at the above statements – Ericsson presented not a single measure to support these claims (and I happen to know that he didn’t interview him either). As we’ll see shortly, it is actually inconceivable that Gladwell’s statements are true – other study of skilled performance show massive variations, and the same will be true for violinists, of this I’m certain. But what he is saying above is that practice is NECESSARY (the first part of the quote – no one succeeds without doing the time), and that practice is SUFFICIENT (the second part – if you do the training, you will achieve the level). This is crucial to this debate – those advocating for 10,000 hours are saying that it is both necessary and sufficient. That all of the above are claims are enormous oversimplifications and without evidence becomes clear when you consider “what the science is actually saying”, to borrow Syed’s words from the clip above. So, the average time taken is 11,053 hours. That’s pretty much in agreement with Ericsson’s violin players. So far so good. But look at that Standard Deviation – 5,538 hours, and it gives a co-efficient of variation of 50%. For those not into the statistics, what this basically shows is a “spread” of the values around the average. If the Standard Deviation is small, and the CV is low, then you have a tight cluster – all the individuals are close to the average. But when it’s 50%, then you know you have massive differences within that group. 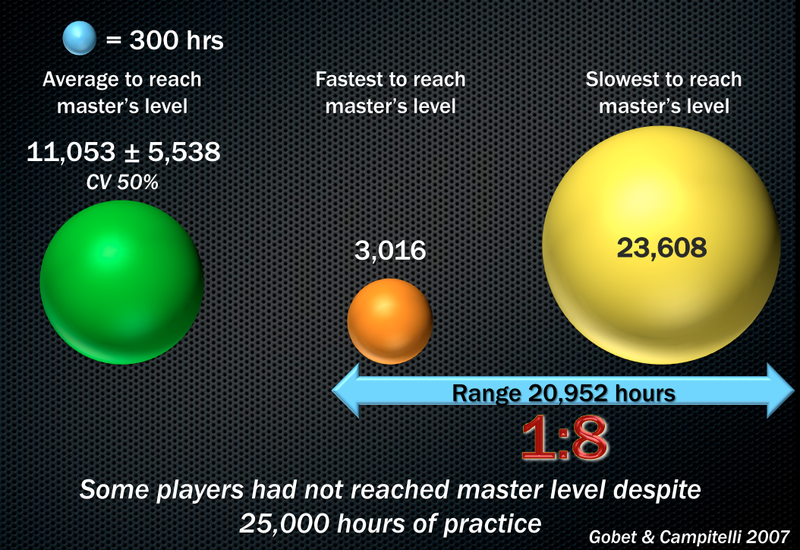 And that’s what happens when you start looking at individuals – one player reaches master level on 3,000 hours, another takes almost 24,000 hours, and some are still practicing but not succeeding. That’s a 21,000 hour difference, which is two entire practice lifetimes according to the model of practice. It seems pretty clear that practice, while important, is not sufficient for some. And for others, it’s not even necessary. The figure above shows how much of performance can be explained by deliberate practice. In chess, which I showed above, it’s 34%. 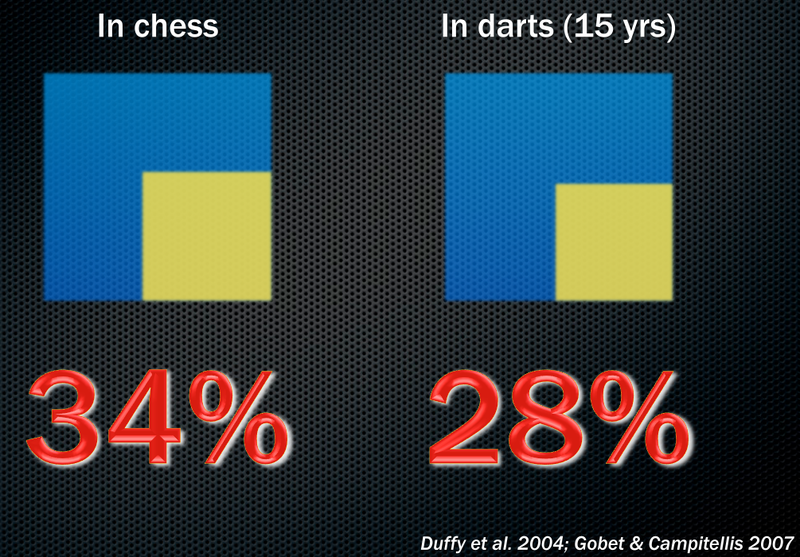 In darts, 15 years of practice explains only 28% of the variation in performance between individuals! An extra-ordinary finding, because with all due respect, that’s in darts…what else is there that influences performance? Yet practice time accounts for only a quarter of the performance differences. What is most interesting about this is that 10 years of practice explained 25% of variability, while 15 years explains 28%. So clearly, the more you practice, the more you can explain performance. That’s not surprising, but the question is this: How many hours of practice would it take to explain “most” of performance as a result of practice? 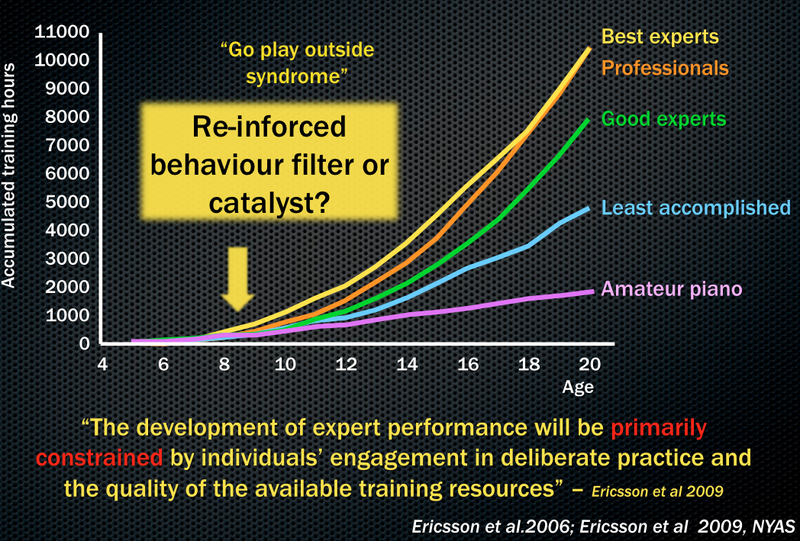 Look at the quote in the figure above, where Ericsson writes that “the development of expert performance will be primarily constrained by individuals’ engagement in deliberate practice” (Ericsson, 2009). Well, 28% is not “primarily constrained” and even though more practice explains more of performance, there is clearly a lot missing from this practice argument. So far, we’ve looked at chess and darts, both skill sports, but neither is “physiologically-limiting” in the way that running, cycling or swimming may be. So let’s expand our examples and look at other sports. Clearly, 10,000 hours are rarely required. A subsequent study on Australian athletes found that 28% had participated for fewer than four years in their sport – that’s probably 3,000 to 4,000 hours, at most. One netball player from Australia had made the international stage on 600 hours of play. Australian skeleton is another interesting example – in 2002, they decided to adopt a systematic, accelerated talent ID approach to skeleton, and looked at sprinters, lifesavers and speed-skaters to find an Olympic skeleton athlete (Bullock et al, 2009). It took fourteen months and they had qualified athletes for the Olympic Games, despite no ice-experience, and despite the prevailing wisdom that you “have to learn a feel for the ice” through years of practice to become elite. Similarly, in the UK, they have had amazing success with accelerated talent ID and talent transfer, producing world champions within years of first introduction to a sport. One important point is that different sports will have different requirements, different capacities for talent transfer and accelerated performance, and thus training time. Rowing, cycling, and canoeing are perhaps easier to learn later in life than skill-heavy sports. 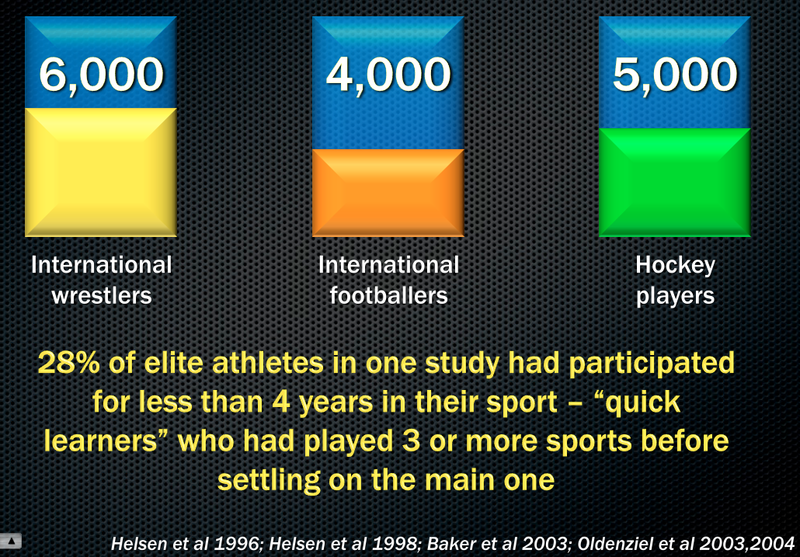 I dare say that tennis, golf may require much earlier exposure and training time – the skill component forces this. Similarly, sports like football or rugby may also require early exposure, because the tactical insights and understanding are crucial to success. However, even here, it’s possible to identify who will go on to become a professional within the very first years of playing the sport – the Gronigen talent studies have shown this, where at the age of 14, children can already be picked as future professionals because they develop skills, improve endurance and learn tactics faster than their peers. Differences in how quickly athletes improve, even in skill sports, suggests innate attributes that are predictive for success. Having mentioned the fact that skill sport success can often be predicted very early, long before a player has accumulated 10,000 hours, it’s worth looking at the examples of two swimmers at this point in the debate. Michael Phelps is the owner of more Olympic golds than any person in history, and his story reveals that greatness can be recognized very early on. He has told this story and described how he started serious training at the age of 11, doing approximately 1,000 hours per year. At the age of 15, he was finishing fifth at the 2000 Olympic Games in Sydney. At 19 he wins 6 golds, and then 8 golds four years after that in Beijing 2008. But the key is that first Olympic performance, fifth at the age of 15, after only 4 years of training. Some will argue that the difference between Phelps in 2000 and Phelps 2008 is eight years of training. I’d say you are partly right, but to me, the bigger issue is physical development – a fifteen year old boy finishing fifth in the world, no matter how physically developed, is clearly marked for great things very early on in their career, long before 10,000 hours are accumulated. Missy Franklin is equally telling. At 16, she won 3 gold medals (and five medals in total) in swimming in Shanghai recently. And she failed to even qualify for the US Olympic Trials at 13, only three years before. So her rise has been, to put it mildly, meteoric, and her arrival as a the best of the elites, precedes 10,000 hours by a long way. My question to advocates of a “genes are less important model, it’s about training” is how does this athlete become a world champion at 16 and with relatively little training, whereas thousands and thousands of others, who train maybe more than she does and over a longer period, will never even make the USA team for swimming? In fact, the question should always be turned around – don’t ask why some succeed, rather ask why most fail? For every example of a champion, there are thousands who get the same training, the same opportunity, but fail to even make national level, let alone become a world champion. Why? The answer to this question, and the question of why the likes of Missy Franklin succeed, is genetics and INNATE TALENT. As mentioned, more on this next time. Finally, let’s go back to the violin study and let me suggest a possible alternative theory for why the best expert performers tend to train more. But the child who has little innate ability makes the violin sound like the death march of stray cats, and their parents do not encourage more play. In fact, they discourage it – the “go play outside” syndrome takes over, and the child is never exposed to teaching or practice. His trajectory is set precisely because he has less innate ability. My point is that the above graph can be explained just as easily using an innate ability argument as it can a deliberate practice argument. The current explanation is been practice, but given what we know about genes, I’d argue that the ‘re-inforced’ behaviour catalyst/filter explanation is just as likely. Those who display greater ability early on (innate ability, that is) are encouraged to practice more, and they set out on that journey towards “best expert” levels, the yellow line, from the beginning. Those who lack innate ability are placed on the blue line. No amount of training will change this, but the behaviour is set early so we never find this out. The result is that ability is determined by practice, on average, but that practice volumes are perhaps themselves influenced by innate ability. Until someone shows that individual differences in performance can be made to disappear with training, and that the differences we measure in performance are not present from the outset, I remain skeptical about an extremist view of performance being due to one factor. Now, I don’t mean to be dismissive of the importance of training. Of course, practice is vital. It is a pre-requisite for success, especially when you have a competitive sport where many are vying for the same medal. In that situation, the person who succeeds must train hard. But their ability to get more out of training, to adapt to training and also to start off from a higher “baseline” is just as important, and those are factors influenced by genes, as I’ll cover in the next post on this topic. To argue that it’s about the training, and to dismiss that genetics play a significant role, is to adopt an untenable and grossly oversimplified position. The 10,000 hour concept is a nice motivational tool, a way to encourage more training, to inspire people to improve. The idea for elite performance is that the right person hears this and believes, and then does the training. But to attribute success to 10,000 hours of training is not only over-simplified, it’s wrong. Matthew Syed, in the clip above, says that one will argue that you “need both talent and opportunity, but that’s not what the science is saying”. The truth is, the science is saying exactly that. Make no mistake – producing champions is incredibly complex. The success of Kenya at distance running, or of Jamaica in sprinting, cannot be reduced to one, or even a few factors. You will find altitude in many places. You will find socio-economic similarities all over the world. But you won’t find champions. Success is probably due to hundreds of different factors, all interacting with one another. But the end result is that if you take 100 aspirant athletes in Kenya, and 100 aspirant athletes in the USA, and expose them to the same training, you will not see anything like the same success rate. And that is due to genetic differences that are too complex to discover with the approach that has been adopted so far. In this post, I’ve looked at the training and practice factor, and hopefully given a broader view on it than the terribly simplified version that 10,000 hours is what it takes. Next time, the genes, and the very certain finding that genetics is vital, both in determining innate ability, and our response to training, and even our motivation or desire to exercise and train in the first place.